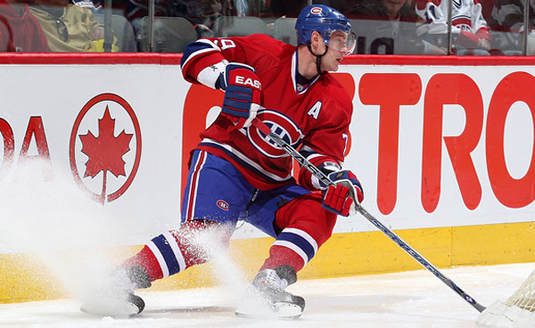 HabsWatch - Providing insight on the Montreal Canadiens: Should they stay, or should they go? Andrei Markov - New contract or trade bait? Marc Bergevin arrived in Montreal on May 2nd, 2012 with a mission; rebuild the Canadiens through the draft. Just two years into restocking the franchise after four straight years (2008-2011) of damage done through a combination of poor drafting and trading high round picks, the Habs were caught between a talent gap coming through their system and a lower salary cap. The only option at the time were cheap stop-gaps but that’s now served its purpose and through ten trades Bergevin has made since being named GM, he’s traded away two 5ths (one today for Mike Weaver from Florida) and one 7th round pick while acquiring a 3rd that was used on Connor Crisp this past summer. So far, his only significant misstep managing the youth movement has been trading Danny Kristo to the New York Rangers for Christian Thomas; one player with only his defensive game keeping him from the NHL for a player that in no way fits the current or near-future makeup of the Montreal Canadiens. So with the trade deadline less than 24 hours away, will Marc Bergevin stay the course being future-focused and avoid paying homage to the disaster of 2008-09 that ultimately saw Koivu, Kovalev, Tanguay, Higgins, Schneider and Komisarek all walk for nothing as UFAs? A painful but necessary reminder of how far back George Gillett and Bob Gainey set the Canadiens for one round of playoff revenue. Thankfully, Bergevin’s UFA concerns this season are limited to Markov, Gionta, Murray, Weaver, Bouillon and Parros with the last two prime waiver candidates for lack of value. Recovering from asset mistakes by restocking core players with UFAs (Cammalleri, Gionta, etc.) is no longer a viable option, if it ever was, to build a team so the only real option to either sign or trade Markov, Gionta and Murray before 3 p.m. Wednesday. The cost of Bergevin stopping his plan mid-stream to re-sign Andrei Markov and Brian Gionta to 35+ contracts, along with a soon to be 34 year old Douglas Murray would be the trading of picks/prospects from a cupboard that’s still only half-full for help in the playoffs. Needless to say, any significant help would cost much more than 5th round picks while the value of Markov, Gionta and even Murray will never be higher than it is right now for teams loading up as legitimate Stanley Cup contenders. Meanwhile, Geoff Molson hopes for the short-term reward of one round of playoff revenue while selling the hope of “anything can happen” for a bit more than that. I much rather see Bergevin stay the course with more low cost, stop-gap help like Mike Weaver to buy time for the next wave to arrive while protecting the organization’s best assets. Beaulieu, Tinordi and Pateryn are now NHL-ready on D, although I have difficulty imagining the Habs breaking in all three together. That’s why I believe of the young guns, Greg Pateryn is probably the most available for help up front. Mike Weaver for a 5th round pick in 2015 today could mean a few things: Murray and Weaver could be together on the 3rd ES pairing and work the PK together which would result in Tinordi going down to join Beaulieu and Pateryn in Hamilton. It could also mean one of the three will get the call to play with Weaver if Murray is traded for something of greater value than a 5th round pick. Ideally, both Markov and Murray will be traded to create pairings along the lines of: Gorges/Subban, Beaulieu/Emelin, Tinordi/Weaver. As it stands now with Andrei Markov in the lineup, the Habs are among the absolute worst D units in the NHL generating 5v5 offense so it’s not a stretch to believe Nathan Beaulieu could help improve it. With contenders looking for a power play specialist, Markov could go a long way towards getting the Habs that young, top 6 scoring right winger they’re in desperate need of. The only reason I can see Brian Gionta possibly re-signing for 1 or 2 years is the lack of high ceiling, NHL-ready right wingers in Hamilton. Once you get past Sven Andrighetto, all 5 foot 9" of him, there’s going to be a wait and some finger-crossing for Sebastian Collberg and/or Mike McCarron. If a package involving Markov gets you that RW, then Bergevin has the flexibility move Gionta as well. Which brings me to Lars Eller. Although he’s improved on faceoffs against quality checkers in the offensive zone this season, improved his overall defensive game and has received the most even strength TOI/G in his four years with Montreal, it’s looking like he'll never have the consistency needed to be the future 2nd line center everyone hoped they were getting in the Jaroslav Halak trade. This season, Eller's has had three major scoring slumps; a singular assist in his last 21 GP and counting, a singular assist in 11 GP and two assists in 12 GP. All in, that's zero goals and four assists spanning 44 games while logging the 5th most ES time per game among the forwards. In my season preview, I wrote that I expected no more than 40 points from Lars Eller this season if he remained in a 3rd line role and now it’s looking like he won’t even crack 30. The opportunity was there for Eller to take on a greater role early in the season when David Desharnais struggled badly his first 19 games but he simply blew it. I'm now at a point where the endless excuses made on Eller’s behalf have truly become tiresome, especially now that he’s got 280 NHL games under his belt; 24 less than Max Pacioretty and 32 more than David Desharnais. It's also worth noting Daniel Briere has as many points in 13 fewer games while bouncing all over the lineup, often with worse line mates than Eller so at some point it’s up to the player to change their destiny. His obvious talent makes the situation horribly frustrating so while I’d be very surprised if Eller was traded by the deadline, given the Habs lack of depth down the middle, I wouldn't be shocked if it happened. Either way, as an RFA this summer, a decision on Eller’s future in Montreal is fast approaching. Fortunately for Bergevin, Eller's coming off a cheap deal meaning the RFA has no leverage whatsoever and that should remove any urgency to make a move by deadline day, unless it ends with a substantial upgrade down the middle. Rene Bourque is a trade candidate but I'm not expecting him to move until the summer when his salary becomes 833k less than his cap hit, which might be somewhat appealing to a cap floor team. Anything before then would likely mean Bergevin taking on a bad contract to get it done. Travis Moen has had a much better season than last year but given Brandon Prust's shoulder problems, he'll likely stay on a bit longer as insurance for the PK. The Habs are traditionally mild sellers leading into trade deadlines so I'm not expecting a lot of movement again this year, which will satisfy no one. If Marc Bergevin is serious about rebuilding the Montreal Canadiens through the draft, the path forward requires the trading of Markov, Gionta and Murray but unfortunately the Habs also have a long history of sacrificing their future for a bite of playoff revenue, even if it's a small bite.